Laminate Flooring mimics the look of traditional woods while offering easy installation and lasting durability. At first glance, it can be difficult to spot the difference between hardwoods and laminate flooring. What appears to be a natural wood grain pattern is really a thin layer of decor paper (a photographic image) under a tough-as-nails protective film that is glued and pressed to a high-density backing board. 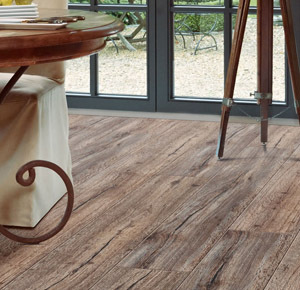 Laminate Flooring comes in an array of wood effects as well as stone and ceramic effects. Laminate floorings main advantages are that it is easy to install, is very hardwearing and relatively inexpensive compared to real hardwood flooring. Laminate flooring is a floating floor, which means it does not fasten directly to the sub-floor. Instead the planks are clicked together. This enables the floor to be fitted fast and with no real mess. Most laminate floors today fit together with a click system with the most common being the UNICLIC system as used by Quick-Step. This is extremely easy and fast to fit. The ingenious UNICLIC-system has a special shape of tongue and groove. You simply place the tongue of one plank into the grove of another at an angle and press down. Their sophisticated and very accurate milled shape makes it possible to create a very tight connection during the installation. The floor can be walked on straight away. If you are laying laminate flooring over a concrete sub-floor then you will fist need to lay down a damp proof membrane (DPM). This is basically a sheet of plastic usually around 5mm which helps protect the Laminate from moisture. On top of this goes the foam underlay this acts as sound absorption and also helps even out minor irregularities in the sub-floor. Most of the leading laminate floor manufactories now also have ranges of flooring that also include built in underlay. This underlay is pre-fitted to the bottom of the flooring and is usually of sound absorbing quality. You do not need to install this type of floor a secondary but if you are laying over a concrete sub-floor you still have to lay down a D.P.M. (Damp Proof Membrane) first. Laminate flooring has been around in Europe for around 15 years and has seen massive growth in the past few years. According to figures from the EPLF , In 2004 over 750 million square meters of laminate floors was sold worldwide this was an increase of 13% on the previous year. The biggest growth market is in the US with an impressive growth rate of 25%.